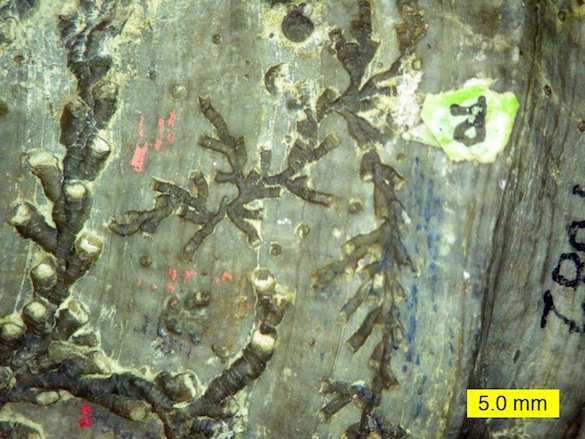 The hederelloids are a group of colonial encrusting organisms found from the Silurian through the Permian, with possible members in the Ordovician and the Triassic (Taylor and Wilson, 2008). 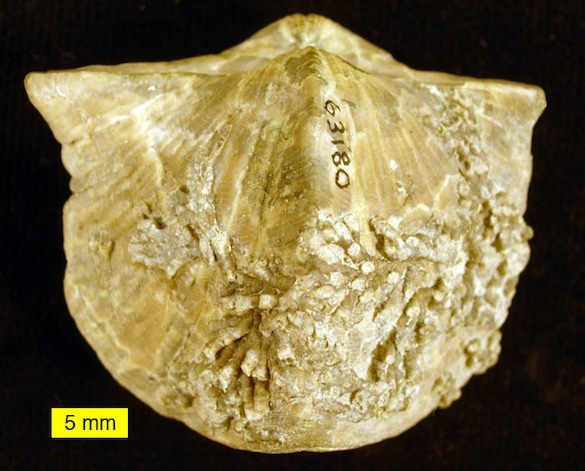 They were entirely marine and were most common by far on Devonian brachiopods and corals. They are “runner-like” encrusters, meaning they grew sequentially across the substrate budding out new members of the colony. 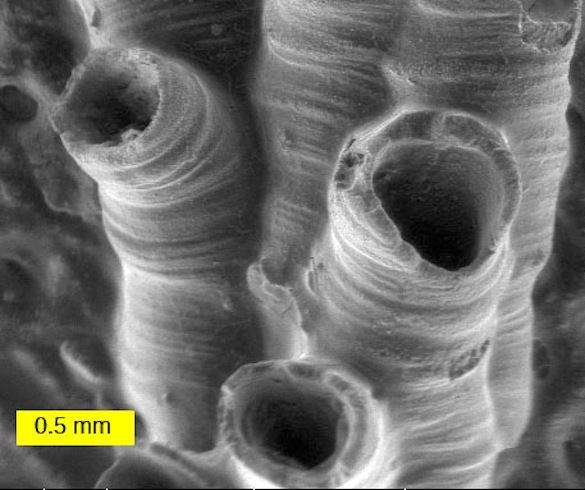 Their zooids (the skeletons that contained the individuals) are usually curved and made of microprismatic calcite secreted from the inside only. (This latter feature meant they could repair damage such as boreholes with patches from the inside; see Wilson and Taylor, 2006). The specimen above is a Devonian spiriferid brachiopod from northwestern Ohio with a hederelloid colony encrusting the dorsal valve. Hederelloids were very diverse in their time. 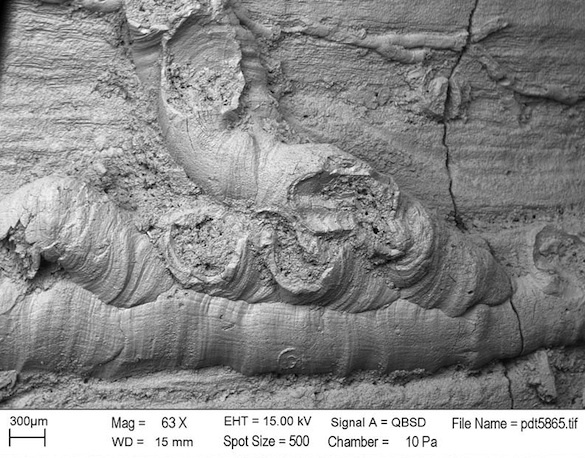 The SEM image above (courtesy of Paul Taylor at the Natural History Museum, London) shows at least two types of hederelloid on a rugose coral from the Devonian of New York. The large tube at the bottom has several lateral buds. At the very top of the view you can see a much smaller hederelloid growing in the opposite direction. The earliest workers on hederelloids thought that they were cyclostome bryozoans of some type (see Bassler, 1939). They look superficially like the common genera Corynotrypa, Cuffeyella and Stomatopora. Hederelloids, though, are significantly larger on the whole, they do not bud in the same pattern as bryozoans, and they do not have lamellar walls. 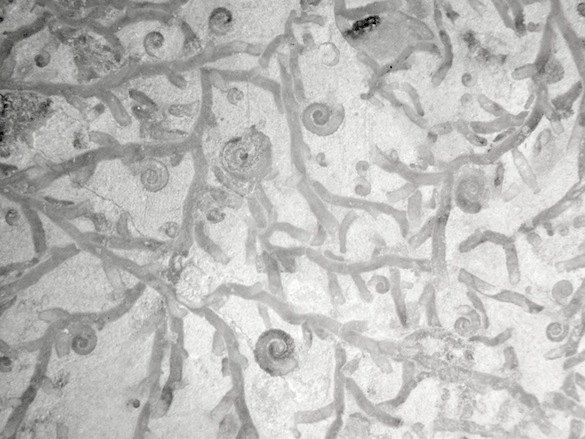 Their shell microstructure and budding patterns suggests instead that they may be related to the phoronids, making them a kind of lophophorate (lophophore-bearing organism; the lophophore is a tentacular feeding device). They could probably, like bryozoans, retract the lophophore into their tubes when necessary. The above photograph shows the underside of a hederelloid colony from the Devonian of Iowa. Note the distinctive budding pattern. The scattered spirals are microconchids. This is a nice collection of hederelloids from the Devonian of New York. Notice the diversity of sizes, shapes and budding patterns. How can you not be fascinated by such enigmatic little creatures? Bassler, R.S. 1939. The Hederelloidea. A suborder of Paleozoic cyclostomatous Bryozoa. Proceedings of the United States National Museum 87: 25-91. Taylor, P.D. and Wilson, M.A. 2008. Morphology and affinities of hederelloid “bryozoans”, p. 301-309. In: Hageman, S.J., Key, M.M., Jr., and Winston, J.E. (eds. ), Bryozoan Studies 2007: Proceedings of the 14th International Bryozoology Conference, Boone, North Carolina, July 1-8, 2007. Virginia Museum of Natural History Special Publication 15. Wilson, M.A. and Taylor, P.D. 2006. Predatory drillholes and partial mortality in Devonian colonial metazoans. Geology 34:565-568.